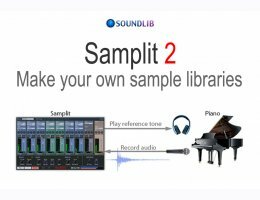 It's never been easier to create new sample libraries for your sampler. From audio plug-ins to MIDI sound modules, including real instruments or even sound effects, you can record them all. You can even mix them together to create more interesting sounds. Most sampler users never bother to create their own sound libraries. There is a good reason for that. It's a very long and repetitive process that requires a lot of recording, editing and testing. And the results are not always up to expectations. At the heart of Samplit, is a new eight track audio mixer. Each track can be assigned to a virtual instrument from your computer or to an audio input from your sound card. If you are looking to record real instruments, look no further. Samplit has some special features that will make the process much easier. Samplit can generate a reference tone to let you know which note to play or sing. You can also adjust the monitor level independently of the recording level. And if a recording has clipped, Samplit will warn you and let you record the same note again. A MIDI output device is required to record external MIDI sound modules. A MIDI input device is required to use the built-in Player.